by Van de Walle, John A.; Karp, Karen S.; Lovin, LouAnn H.; Bay-Williams, Jennifer M.
Note: This is the bound book only and does not include access to the Enhanced Pearson eText. To order the Enhanced Pearson eText packaged with a bound book, use ISBN 0134081412. Helping students make connections between mathematics and their worlds—and helping them feel empowered to use math in their lives—is the focus of this widely popular guide. Designed for classroom teachers, the book focuses on specific grade bands and includes information on creating an effective classroom environment, aligning teaching to various standards and practices, such as the Common Core State Standards and NCTM’s teaching practices, and engaging families. 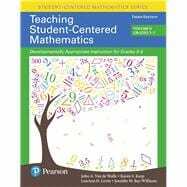 The first portion of the book addresses how to build a student-centered environment in which children can become mathematically proficient, while the second portion focuses on practical ways to teach important concepts in a student-centered fashion. The new edition features a corresponding Enhanced Pearson eText version with links to embedded videos, blackline masters, downloadable teacher resource and activity pages, lesson plans, activities correlated to the CCSS, and tables of common errors and misconceptions. The late John A. Van de Walle was a professor emeritus at Virginia Commonwealth University. He was a mathematics education consultant who regularly gave professional development workshops for K–8 teachers in the United States and Canada. He visited and taught in elementary school classrooms and worked with teachers to implement student centered math lessons. He co authored the Scott Foresman Addison Wesley Mathematics K–6 series and contributed to the Pearson School mathematics program, enVisionMATH. In addition, he wrote numerous chapters and articles for the National Council of Teachers of Mathematics (NCTM) books and journals and was very active in NCTM, including serving on the Board of Directors, as the chair of the Educational Materials Committee, and as a frequent speaker at national and regional meetings. Karen S. Karp is at the School of Education at Johns Hopkins University-Baltimore, MD. Previously, she was a professor of mathematics education at the University of Louisville for more than twenty years. Prior to entering the field of teacher education she was an elementary school teacher in New York. She is also co author of Elementary and Middle School Mathematics: Teaching Developmentally, Developing Essential Understanding of Addition and Subtraction for Teaching Mathematics in Pre K–Grade 2, and numerous book chapters and articles. She is a former member of the Board of Directors of NCTM and a former president of the Association of Mathematics Teacher Educators (AMTE). She continues to work in classrooms to support teachers of students with disabilities in their mathematics instruction. LouAnn H. Lovin is a professor of mathematics education at James Madison University (Virginia). She co authored the first edition of the Teaching Student Centered Mathematics Professional Development Series with John A. Van de Walle as well as Teaching Mathematics Meaningfully: Solutions for Reaching Struggling Learners, 2nd Edition with David Allsopp and Sarah Vaningen. LouAnn taught mathematics to middle and high school students before transitioning to pre K–grade 8. For almost twenty years, she has worked in pre K through grade 8 classrooms and engaged with teachers in professional development as they implement a student centered approach to teaching mathematics. She has published articles in Teaching Children Mathematics, Mathematics Teaching in the Middle School, and Teaching Exceptional Children and has served on NCTM’s Educational Materials Committee. LouAnn’s research on teachers’ mathematical knowledge for teaching has focused most recently on the developmental nature of prospective teachers’ fraction knowledge. Jennifer M. Bay- Williams is a professor of mathematics education at the University of Louisville (Kentucky). Jennifer has published many articles on teaching and learning in NCTM journals. She has also coauthored numerous books, including Mathematics Coaching: Resources and Tools for Coaches and Leaders, K–12; Developing Essential Understanding of Addition and Subtraction for Teaching Mathematics in Pre K–Grade 2; Math and Literature: Grades 6–8; Math and Nonfiction: Grades 6–8; and Navigating through Connections in Grades 6–8. Jennifer taught elementary, middle, and high school in Missouri and in Peru, and continues to work in classrooms at all levels with students and with teachers. Jennifer served as member of Board of Directors for TODOS: Equity for All, as president of AMTE, and as editor for the 2012 NCTM Yearbook.